Wat is dit voor site? Wij zoeken de goedkoopste boeken op internet. 30 Minute Gardeningvonden we het goedkoopst op Bol.com voor €0. We hebben gezocht in nieuwe en tweedehands boeken. Rechtsonderaan de pagina kan je het boek direct bestellen	via Bol	.com. Shameless shortcuts for a great garden super-fast Love being in the garden but not keen on spending the whole weekend making it look perfect? 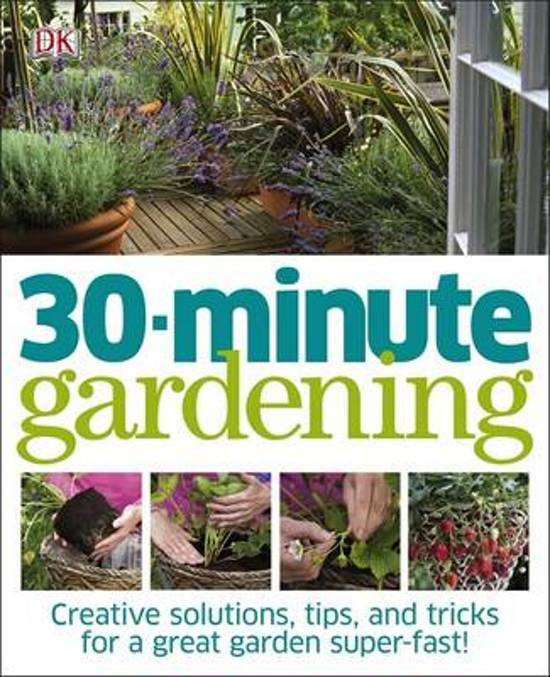 If so, then 30 Minute Gardening is just the book you've been looking for. This will have you sitting down enjoying a drink on the patio after just 30 minutes of stress-free, guilt-free gardening. Packed full of shameless shortcuts and practical tips and ideas that have instant impact, all the know-how is broken down into simple steps and picture sequences including 122 projects on creating beautiful borders, perfect patio pots and how to keep your salad growing all summer. 30 Minute Gardening is the perfect rescue remedy for anyone who loves gardening but has little time on their hands. It's all about how to have a neat garden, a pretty garden, a productive garden...and still have a life. Subtitel Creative Solutions, Tips and Trics for a Great Garden Super-Fast!